Here’s my interpretation of this week’s WordPress Photo Challenge: Foreshadow, which is a verb meaning “to act as a warning or sign of indication of a future event”. Photos I love – and why! This entry was tagged Andalucía, culture, Europe, fiestas, life, photography, Post a week, Spain, travel, Weekly Photo challenge. Bookmark the permalink. Marianne, great photograph and very clever. This is a ‘sombre’ foreshadow! 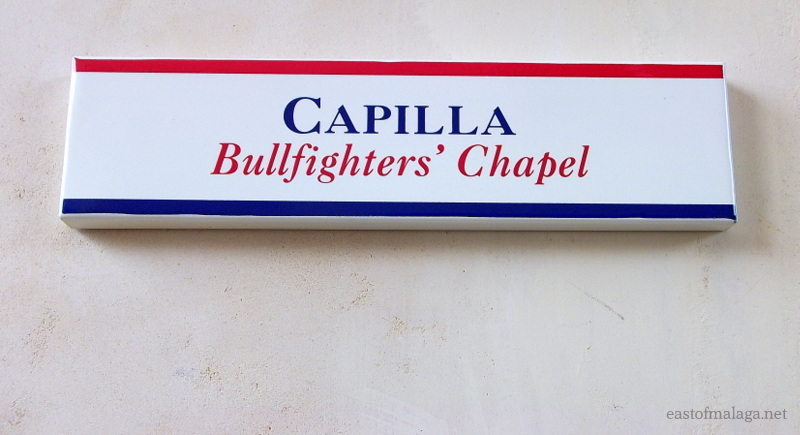 I wonder if the bulls have their own private chapel round the back? A nice idea, but I doubt it, sadly. I must admit, that whenever they show a bullfighter being gored by a bull on Spanish TV, I always give a big cheer (as long as he’s not too badly injured). Does that make me a bad person? Ooh, that’s brilliant, Marianne. Gulp. You didn’t have much time though – and there was so much else to see, Cathy. I’m sure there would be a lot of rituals for the bullfighters, prayer being amongst them. Great take on ‘foreshadow’. I’m sure you’re right, EllaDee – but, somehow it still came as a surprise when I came across the tiny chapel. Thanks for your lovely comment – much appreciated.